What a beautiful weekend this has turned out to be! As I sit here blogging, it must be 70+ degrees outside! This week was about me learning to keep my life balanced..mainly when it comes to keeping in contact and seeing my friends. With a demanding full time job and training picking up, that can be a very hard task but I think I managed pretty well this week! A Monday night bbq, Tuesday night at Hog's Oysters, Wednesday night at the Pub after track with witty banter, homemade chips and chicken tortilla soup, had a lovely night on Thursday but by Friday night, I was home in bed! Yes, I missed out on 80's prom but if you had a 12 mile run the next morning, you too may consider missing 80's prom! Speaking of 12 mile run, Hez and I met at the monkey bars on the Marina Green and started towards Sausalito for our 11.5 mile run which took us into downtown Sausalito. We even made it to a few open houses along the way! The run was good..long but good. Some friends will ask how I deal with long workouts and having to run 12 miles. Basically, I get mentally prepared for it during the week. It's on my mind that I am running that mileage. During the run, I break it down. Instead of thinking I have to run 12 miles, I focus on the first part of the run..6 miles. And then once I get to 6 miles, I have to turn around to get back to my car to go home so no whining there. You just do it! My tendon that runs along my foot to my big toe has been in pain for the last two weeks..I realized yesterday that it's because my laces have been too tight! Duh! Should have known that!! After my run, I stopped by Sports Basement and walked out with way too much! I went in thinking I just needed to buy more Hammer gels to go with my sustained energy. Well, I walked out with Hammer gels, a pair of new tires, tubes, CO2s, a box of Clif bars, and more crap then I intended! One hour and $228 later, I was back in my car! Mind you, I had a 20% coupon! Saturday afternoon, I met up with my friend Mel R. for lunch at one of my favorite spots, Lettus. It was just one of those lovely sunny afternoons that prompted you to sit out with a glass of wine to enjoy the weather and that's exactly what Mel and I decided to do! I say it like it's rare because I don't drink much but Saturday afternoon was just one of those days! Many others had the same idea as we discovered at the wine bar :). Sunday..we had a spinerval at Lake Merced. We did 60 min on the bike and a 10 min. run...repeat 4 times! Yes people 4 times! I only made it to three because my tendon has swollen up to a bubble and wearing my running shoes or my cycling shoes..putting pressure on that tendon was too much for me to handle. I didn't want to risk injuring or irritating it more so I stopped after 3. No doubt though that I will make it up at next weekend's boot camp of workouts! 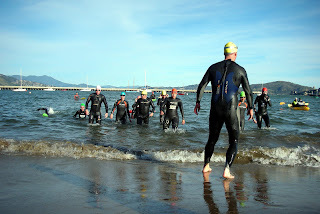 Below are pics from last Sunday's workout at Aquatic Park. 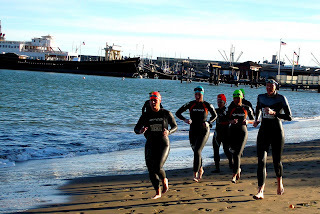 I am in the orange Orca 3.8 wetsuit and a green swim cap! 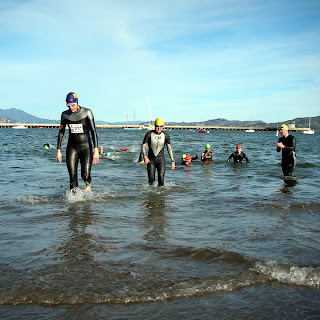 Condolences goes out to the families of two local atheletes- Kristy Gough and Matt Peterson. They were struck and killed yesterday while out riding. I am once again reminded of the dangers of our sport. Drivers out there, please be more careful! We as cyclists are vulnerable out on the road!